JH Audio most likely has the most experience with building custom IEMs in the world. As a result their units are absolutely flawless and they set the bar (high) for the other competing companies to reach. All of JH’s CIEMs are handcrafted in the USA. All of the universal and custom monitors are built in Orlando, Florida. 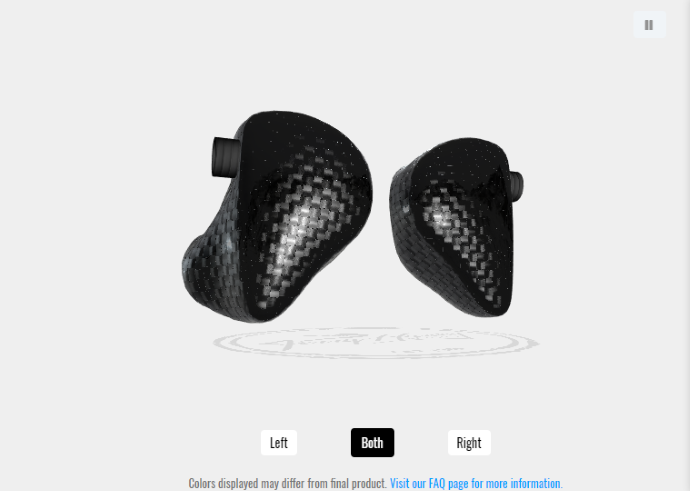 Each set is assembled by hand using JH Audio’s proprietary drivers, crossover components, as well as custom finishes including Carbon Fiber to create the most beautiful looking and sounding earpieces. 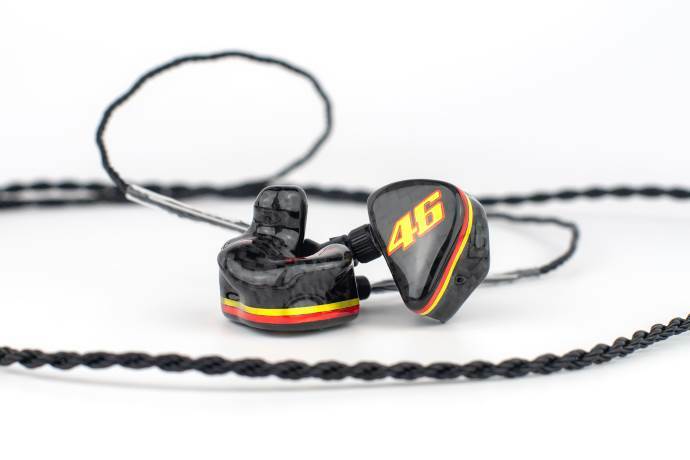 JH Audio is proud to manufacture their in-ears by using old school craftsmanship, while using the most cutting edge Technology. We’ll get into the design of my set in a bit but this without doubt is the cleanest, best built unit in my collection. Everything just is perfect and JH did a more than excellent job with my full carbon set. The face plate closing, canals (length + comfort), artwork, connectors, bores, inside labeling, etc. It’s pure perfection: 11/10. Comfort wise my set probably is the tightest set in my collection. It’s the hardest to get into my ears, but the fit, isolation and comfort are – again – perfect. In fact, after listening to the JH13V2 PRO, all my other monitors feel a bit loose and I sometimes wish they were more like this JH. Breaking the seal is impossible, making them fall out of your ear? Never going to happen. The JH13V2 PRO is stage and wild artist proof, it’s not going to fail on you doing a show. And that means it certainly will never fail for “normal” audiophiles such as we are. JH Audio has one of the best creator tools on the market and I find myself using it most of the time to show other brands the artwork I would like on the new set of monitors they’ll be building for me. The design process has been a real experience and I’m extremely happy with the result. I sent in some of my ideas and a screenshot of my idea to JH creative people and they as a team exchanged ideas, improved the design and came with their own suggestions. Their Art Director in charge also followed the design procedure for this set and they all were a pleasure to work with. He stated: “We’re not satisfied unless we create a challenge for ourselves so that’s nothing at all to worry about, we take as much pride in our appearance as we do in our sound”. JH’s creative team has all the needed skills to build you a unique set of CIEMs taking into account all of your requirements. If you want your set to be build exactly the way you created it in the designer, JH will of course do that but I really recommend implicating the design team as they come up with the most gorgeous designs. Our Lola and Layla samples also prove that JH absolutely has the design part nailed down. It was a very basic design and JH probably felt the same way and so they came up with a different design: full carbon shell, multi-color artwork, a double halo band around the shell in VR’s colors and a glossy finish. The halo bands are thinner bands (one yellow brushed titanium and one red brushed titanium) that run side by side around the shell to really give them the racing aesthetic. 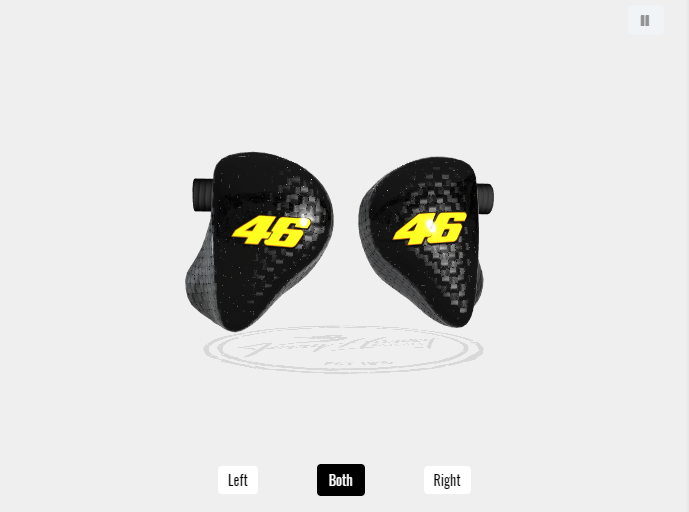 It’s absolutely stunning to me as a Valentino Rossi fan, even though the colors are more from his earlier days. JH Audio’s cable system is special and unique. Linus has already covered it in detail in his Lola and Layla reviews as well. Almost all Jerry Harvey IEMs come with a four-pin detachable cable. The connectors on each side can be screwed on or off, which for me personally feels more secure than any other way. Each side can only be connected in a specific way, so you will not end up with wrong connected phases. This connection made it impossible for me to try out different cables though, because all my aftermarket cables and (C)IEMS have a 2-pin or MMCX style finish, except for the UM Mason V3. 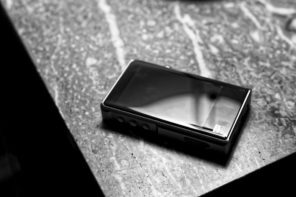 The supplied eight-wire cable is built by Moon Audio cable and it’s of very high quality already, so there’s no pain in not cable-rolling for this review. As said, these cables feature the proprietary bass module which allows you to set the bass from neutral (0dB) to bassy (+12dB). In order to do so you need a mini screw driver which comes with your monitors. It’s a really nice system but I have to say I have never changed the bass level ever since I found my sweet spot. Your JH Audio monitor will come with the stock 3.5mm single ended cable but JH actually also offers you an optional balanced 2.5mm cable which I definitely recommend getting if you like the balanced sound characteristics your source offers. This cable is also made by Moon Audio and it has the 4-pin cable connection with twist lock collar and a Gold-Plated 2.5mm Input Connector. The balanced cable will set you back $150USD. But to me that’s worth it, and that’s till cheaper than many aftermarket boutique IEM cables. You can find the balanced cables dedicated page here: https://jhaudio.com//p/4-pin-balanced-cable . A replacement 3.5mm cable will cost you $100 USD from Moon Audio or directly from JH Audio. 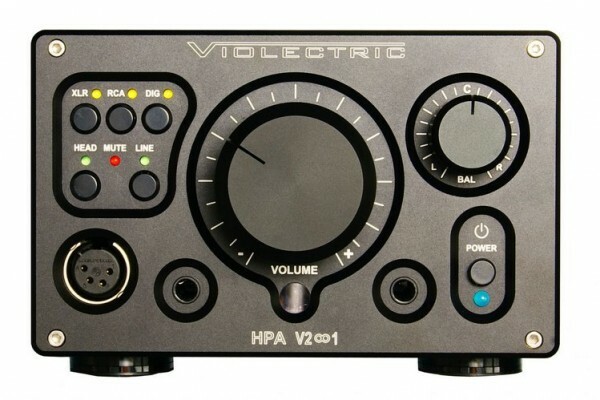 The JH13V2 PRO is now starting at only $1299 without any special options, last year that was $1175 without options when I ordered it, so there was a 10% price increase since then. My unit back then set you back $1855USD with all the options and shipping included ($2050USD with the optional balanced cable). For a monitor of this level from Jerry Harvey that price is more than correct, especially if you see the prices of the 8-drivers of some of the competition. If you don’t want any crazy options like me, you can already own this monitor for only $1299, a buy! The JH package is basic but correct and more aimed to the pro market. The monitor comes in a nice box with the iconic personalized Jerry Harvey Signature IEM case, a wax removal tool, a Comply Wrap sample and the mini screw driver to set the bass.